Wessex Sound are the Official Southern UK dealer for the NOVA Acoustic range of loudspeakers and amplifiers. CRAAFT AUDIO GmbH have over 30 years experience developing high performance audio products for the audio installation, cinema and audio rental markets. 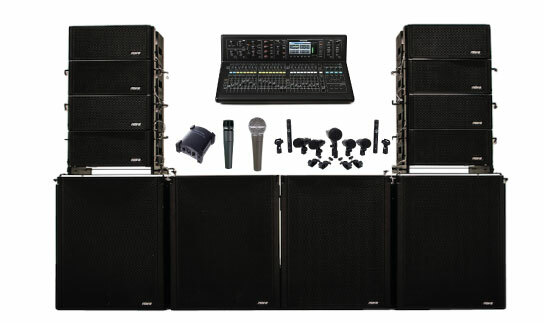 Their products are typically used by bands and musicians, AV hire companies, Churches, Night Clubs & Stadiums etc. The brand NOVA© (NOVACOUSTIC©) stands for innovation, modern technologies and outstanding ratio of price and performance. The Nova production departments in Germany use high performance components, such as from BMS©, B&C©, BEYMA©, 18-SOUND©, FAITAL© as well as own components. Wessex Sound stock a number of Nova Systems, our brilliant Elite Compact system is suitable for up to 1500 people and can be expanded up to 8000 people when multiple ELC26 elements are flown in an array of 16 boxes per side. If you interested in more information or to discover the range of products available please contact us on 02380 170272 or email sales@wessexsound.co.uk. Did you know we can Deliver, Setup & Collect all our equipment packages? Competent, convenient and trouble free. Great Service, very easy going and accommodating!! Wessex Sound Hire were very easy to deal with from initial advice and quotation through to completion of order. No hesitation in recommending their services. I'd highly recommend Wessex Sound! We realised that we had no PA system the day before a wedding due to a misunderstanding with the hotel hosting the event. I dealt with Alex who was super pro and saved the party by agreeing to drop the system off at the venue the next morning. I'd completely trust the website guidelines for system size - we didn't turn the PA up past half because it went so loud, we were running two technics decks and a pioneer mixer setup through the 'Small Venue' PA, but the sound quality was super crisp and filled the space beautifully. Ninja service too as the PA had already been collected when I returned to the hall the next morning after a hungover breakfast! Great kit and fantastic service for a reasonable price. Please send us a message to discuss your next event! We will get back to you within 24 hours!